The departure today of AC005 marks the launch of the very first scheduled flight between Montreal and Japan. 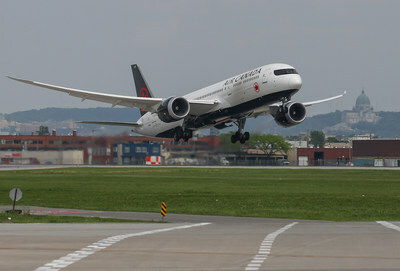 Flights will operate year-round with Air Canada's flagship aircraft, the Boeing 787 Dreamliner, daily during summer peak travel and three times a week during the winter. Air Canada's new transpacific service from its Montreal hub is designed to optimize connectivity to several Canadian and U.S. cities: Quebec City, Ottawa, Halifax, Charlottetown, Boston, Philadelphia and Orlando. "The launch of Montreal's first scheduled link to Japan will also offer travellers from Atlantic Canada and the Northeastern U.S. convenient access to Japan and beyond, complementing our existing Tokyo flights from Toronto, Vancouver and Calgary, while also strategically positioning Air Canada as a leader in the growing Montreal–Asia market. This further reflects Air Canada's commitment to support the local business and tourism community through its ongoing international growth strategy from Montreal, following the introduction of non-stop flights to Shanghai, Lima, Algiers and upcoming launches to Dublin, Bucharest and Lisbon," said Mark Galardo, Vice president, Network Planning at Air Canada as he boarded the aircraft with the Mayor of Montreal Valerie Plante and a delegation of officials from the Montreal business and Tourism community off to Tokyo on a trade mission. "As Canada's Minister of International Trade, I am delighted to offer my warmest congratulations to Air Canada and to Aéroports de Montréal on the occasion of the launch of the new Montreal-Tokyo direct flight! In addition to the two direct flights from Montreal to Beijing and Shanghai, this marks the third direct linkage between Montreal and Asia launched in the past three years, setting the stage for ever-closer commercial, tourism, and cultural ties between Montreal and Asia," said François-Philippe Champagne, Minister of International Trade. "Asia is one of the most economically dynamic regions in the world, and Japan is our largest trading partner within the recently-concluded Comprehensive and Progressive Trans-Pacific Partnership trade agreement (CPTPP). As Canadian companies continue to seek to diversify their export markets, this new flight to Japan will play a key role in underpinning their efforts and also in further spurring Montreal's already impressive international profile, as well as its connections to both Japan and beyond." The Minister of International Relations and of La Francophonie, and the Minister responsible for the Laurentians, Christine St-Pierre, who participated in the inauguration ceremony, said: "This service will further boost our relationship with Japan. I also invite Japanese to discover all that Quebec has to offer them, such as its creativity, dynamism and unique culture. I am confident that this flight will also stimulate activities of Quebec companies already in Japan as well as promote the growth of our commercial, cultural and scientific exchanges. Our already well-established relationship includes a 45-year presence of our General Delegation in Tokyo. It will thrive even more following the launch of this new direct flight. I also want to salute the work of all those who have been involved in establishing this service offering an additional link between Japan and Quebec. " "This is a first in Canadian aviation history. It brings our cities closer and paves the way to fruitful bilateral exchanges, whether commercial, personal, cultural, academic, or touristic. I would like to congratulate Air Canada for its initiative to create the Montreal-Tokyo direct link, which will open access to this strategic market for Montreal businesses and that will increase our power to attract and retain Japanese investments in our metropolis. We must not stop here: more direct international flights translate into a city that is increasingly open to the world," said Montreal Mayor Valérie Plante. "The Montreal-Tokyo-Narita route is our 3rd direct link to Asia. This new link will build a new bridge between the Montreal and Japanese communities, to the delight of the business community and leisure travellers who will now be able to visit the land of the rising sun much more easily. The accelerated development of Montréal-Trudeau's air service undeniably confirms its position as a world-class airport, but above all, as a strategic hub for air traffic. Montréal-Trudeau currently serves 148 destinations, 89 of which are international. I thank Air Canada, our major partner who, by increasing its service offering from Montreal, is clearly contributing to the significant and sustained growth of our passenger traffic," said Philippe Rainville, President and Chief Executive Officer of ADM.
"Alliance de l'industrie touristique du Québec and its partners are actively working in international markets to promote Quebec as a world-class destination," said Martin Soucy, President and Chief Executive Officer of Québec's tourism industry association. "The Alliance welcomes the arrival of the Montreal-Tokyo flight and congratulates Air Canada for opening new development opportunities on the Asian market. Improved accessibility through the addition of air links is key in continuing the vigorous growth in the number of international tourists we welcome and who generate significant economic benefits for Quebec." "Tourisme Montréal enthusiastically welcomes all efforts to make Montreal more accessible and improve its standing as a leading international destination. Adding a direct flight between Tokyo and Montreal is an important milestone in our strategy to promote Montreal and Quebec to tourists from around the world. Air Canada can count on our support to attract visitors and ensure the economic viability of this new direct air connection," said Yves Lalumière, President and Chief Executive Officer of Tourisme Montréal. Air Canada's Boeing 787 Dreamliner aircraft feature three cabins of service offering comfortable ergonomic seating and enhanced definition intuitive touch personal entertainment screens. 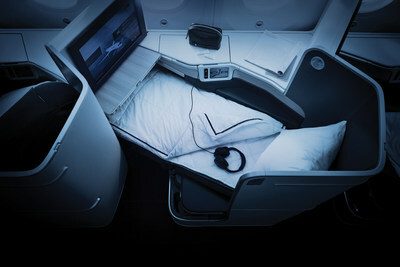 Air Canada's Signature Class has 180-degree lie-flat seats in configuration guaranteeing direct aisle access. The Premium Economy cabin offers more generous personal space, wider seats, greater legroom and recline, premium meals, complimentary bar service, priority check-in and baggage delivery at the airport. The Economy cabin has slimline seats providing comfortable personal space and state-of-the-art individual on-demand entertainment system. Air Canada operates more non-stop flights between Canada and Japan than any other carrier with up to 37 non-stop return flights between Canada and Japan per week. Complimenting the new service between Montreal–Tokyo Narita, Air Canada operates daily flights between Vancouver–Tokyo Narita; daily flights between Toronto and Tokyo Haneda; summer seasonal flights up to seven times a week between Calgary–Tokyo Narita. Air Canada Rouge also offers summer seasonal service to Osaka's Kansai International Airport up to six times per week and to Chubu Centrair International Airport in Nagoya up to three times per week.